New footage of debris from an Atlas V Centaur rocket's upper stage soaring through space nearly ten years after its launch has highlighted the ever-growing concerns over space junk. The European Space Agency today shared a look at the fragments captured just last month by the Deimos Sky Survey, revealing an estimated 40 to 60 pieces that could each be larger than a foot (30 cm) in size. It comes as a top United States military official warned that one of Earth's biggest space-borne threats may in fact be the 'junk' left over from human exploration. At a recent hearing on a proposal by President Donald Trump to establish a so-called Space Force, US Air Force Gen. John Hyten told officials that a growing amount of debris left to orbit Earth poses considerable risks and should be a major priority. 'I’ve advocated for a long time for the development of some kind of international norms and behaviors in space,' said Hyten, according to CNBC . The threat of space junk has come into full focus in recent years, as scientists and countries around the world begin to accelerate the launch of satellites and other orbitals that may be affected. And, India's anti-satellite missile test last month has further pushed the issue into the spotlight. This week, according to a recent announcement from the European Space Agency, debris from the late stage of a rocket was captured on video breaking into pieces, giving scientists a rare glimpse into how debris is formed. The rocket that produced the waste, which started out as 12.5-meter-long upper stage, launched in September 2009. 'Leaving a trail of debris in its wake, this fragmentation event provides space debris experts with a rare opportunity to test their understanding of such hugely important processes,' explains Tim Flohrer, ESA's Senior Space Debris Monitoring Expert. The researchers hope to use the event to model how space junk operates around Earth's orbit. After India's recent test of an anti-satellite missile, NASA criticized the country's for creating hundreds of new pieces of space junk which threatens to damage the International Space Station. 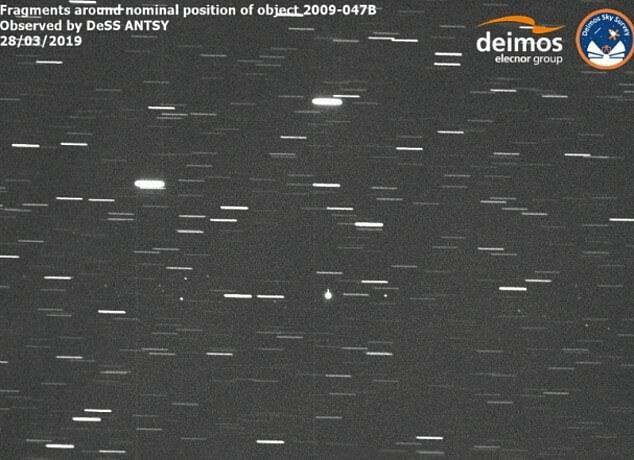 A similar test from China in 2007 created 3,000 new pieces of space junk alone. Scientists have warned that a growing amount of debris could have an array of adverse effects on future space missions. Already there are more than 12,000 of pieces of space junk currently orbiting Earth which threaten to collide with important satellites or interfere with launches and landings of space craft. Though the problem is well-documented, a solution has been less forthcoming. While some proposals have involved capturing debris with a net and then dragging the trash into Earth's atmosphere where it will burn up, others have involved a more abrasive approach of harpooning junk and siphoning it in. In a more high tech solution, objects would be irradiated with a laser until it is essentially vaporized. No matter what the solution is, researchers say mitigating the Earth's shroud of space junk will likely be an international effort. The recent video observation of rocket debris saw the cooperation of several countries including Spain, Russia, and Switzerland, in what they hope will set an international standard. There are an estimated 170 million pieces of so-called 'space junk' - left behind after missions that can be as big as spent rocket stages or as small as paint flakes - in orbit alongside some US$700 billion of space infrastructure. However, traditional gripping methods don't work in space, as suction cups do not function in a vacuum and temperatures are too cold for substances like tape and glue. Grippers based around magnets are useless because most of the debris in orbit around Earth is not magnetic. Most proposed solutions, including debris harpoons, either require or cause forceful interaction with the debris, which could push those objects in unintended, unpredictable directions. Scientists point to two events that have badly worsened the problem of space junk. The first was in February 2009, when an Iridium telecoms satellite and Kosmos-2251, a Russian military satellite, accidentally collided. The second was in January 2007, when China tested an anti-satellite weapon on an old Fengyun weather satellite. Experts also pointed to two sites that have become worryingly cluttered. One is low Earth orbit which is used by satnav satellites, the ISS, China's manned missions and the Hubble telescope, among others. The other is in geostationary orbit, and is used by communications, weather and surveillance satellites that must maintain a fixed position relative to Earth.